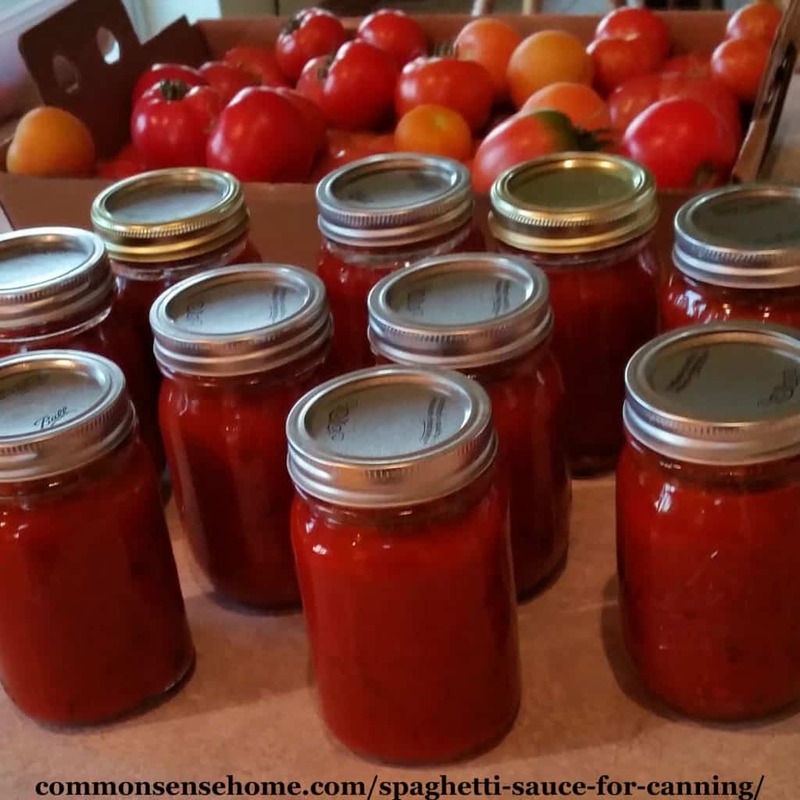 A good spaghetti sauce recipe for canning is a must in our house, because many commercial spaghetti sauces use ingredients like genetically modified high fructose corn syrup and soybean oil – not things we normally eat. My husband came in from outside the first time I was canning spaghetti sauce, smiled and said the house smelled like an Italian restaurant – a good Italian restaurant. I had to agree. It takes a while to cook, but the end result is delicious! I start a batch in the morning, and slow cook while I'm working on other things in the kitchen, like prepping the rest of the ingredients and canning equipment. Paste tomatoes will yield a thicker sauce with less cooking, but you can use any tomatoes that you have available. You can also cut this spaghetti sauce recipe in half or to a fourth. 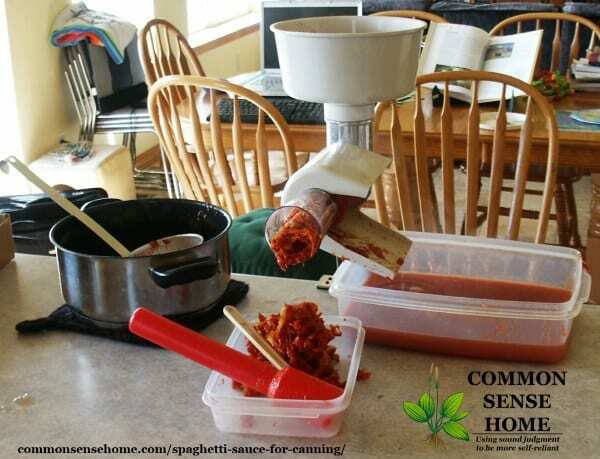 Just keep the processing time the same, or freeze the spaghetti sauce instead of canning. 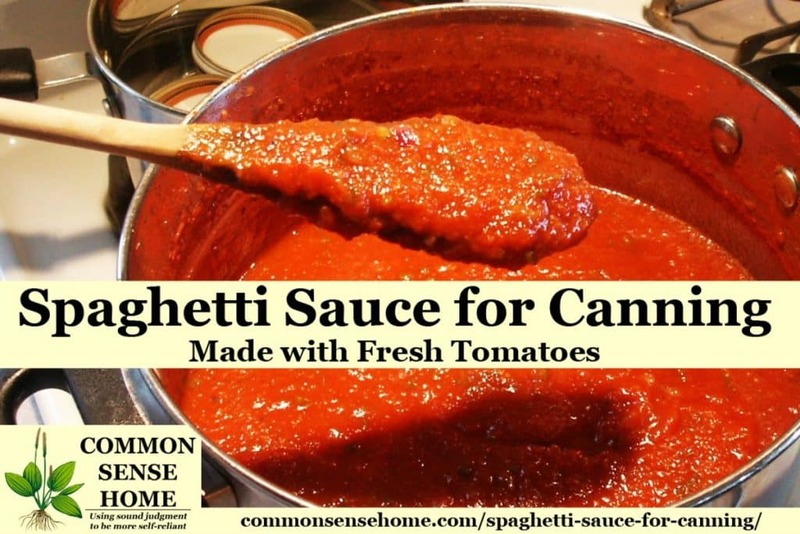 NOTE: You do need to use a pressure canner for canning this spaghetti sauce recipe, since it contains low acid ingredients like oil and onions. See The Natural Canning Resource Book for a full explanation of safe canning practices, or “How to Can Food at Home – Quick Guide to Safe Home Canning” for a quick review of the basics. My favorite canning spaghetti sauce recipe is adapted from The Encyclopedia of Country Living by Carla Emery. 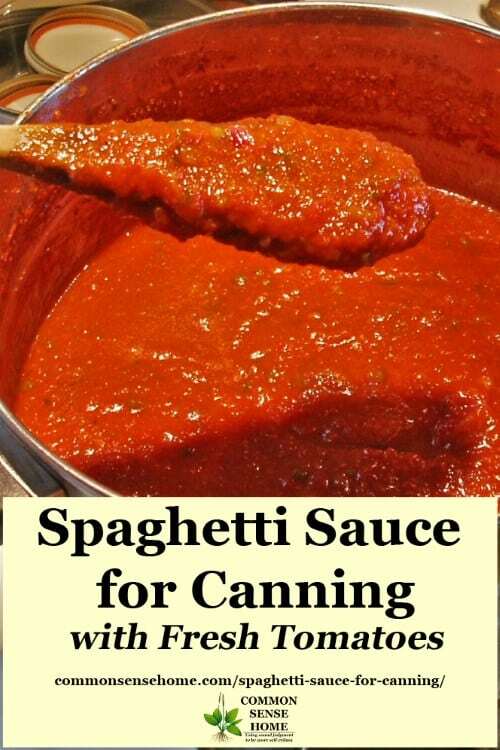 This recipe is very close to the “Spaghetti sauce without Meat” recipe listed on the National Center for Home Food Preservation website, so you know it's a safe canning recipe. Wash 30 pounds of tomatoes. Remove cores and quarter tomatoes. Cook 20 minutes, uncovered, in large pan or pans to soften tomatoes. I cook mine at a strong simmer in an assortment of heavy bottom stainless steel pans. I have also used a Nesco roaster. Thick bottom pans prevent accidental scorching, frequent stirring is recommended. Don't use aluminum, folks, it will react with the acid in the tomatoes. When I cook on the stove top, I start with four pans and cook the sauce down to one 8 quart stockpot. Put tomatoes through a food strainer or food mill. I have a Back to Basics food strainer that works beautifully. Years ago I used a chinoise strainer, and I still use it for small batches, but for large batches the food strainer can't be beat. It's so much faster! Cook down tomatoes to reduce volume and make a thicker sauce. We start with four pots and end up with one. This is the base of your spaghetti sauce. While the sauce is cooking, you can do the rest of the prep work, like chopping the rest of your veggies, filling the canner, and getting the lids and jars ready. My pressure canner uses three quarts of water, to which I add one tablespoon of white vinegar to reduce hard water build up on the jars. I wash my jars in the dishwasher and keep them hot until I'm ready to fill. I keep my lids in hot water in a one quart saucepan (do not boil lids), and use kitchen tongs for lifting them out of the water. The latest generation of canning lids from Ball do not require preheating, but I have a stock of lids that I am still working through. Saute in 1/4 cup butter or olive oil until tender: onions, garlic, celery or green pepper, and mushrooms. Combine sauteed vegetables and tomatoes. Add salt, black pepper, oregano, parsley and sugar. Bring to a boil. Stir frequently to avoid burning. Reduce heat to simmer, keep hot while waiting to process. Fill jars, leaving 1 inch headspace. Adjust lids. Process in a pressure canner 20 minutes for pints, 25 minutes for quarts. If using a weighted-gauge canner, set at 10 pounds pressure at 0-1,000 feet above sea level; set at 15 pounds pressure at higher altitudes. If using a dial-gauge canner; set at 11 pounds pressure at 0-2000 feet above sea level; 12 pounds at 2,001-4,000 feet; 13 pounds at 4,001-6,000 feet; 14 pounds at 6.001-8,000 feet; or 15 pounds above 8,000 feet. Allow canner to cool and release pressure. Remove jars and set on towel on counter. Let rest until cool, or overnight. Remove rings, wipe any spills. Date and label and store in a cool, dry location, out of direct sunlight. Best used within 1-2 years. Yields around eight pints of home canned spaghetti sauce. 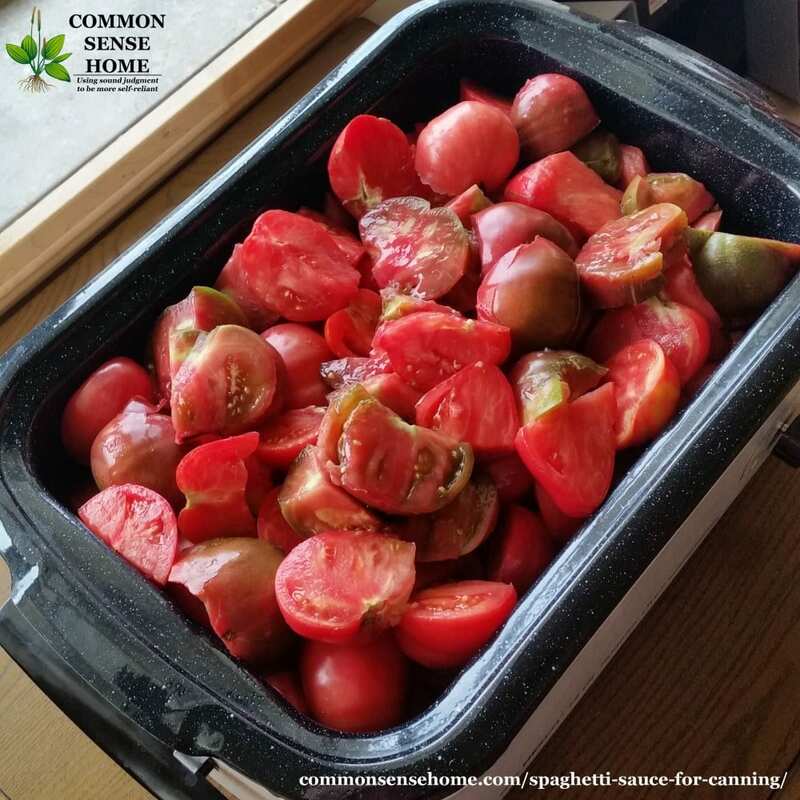 If you don't have enough ripe tomatoes at one time for canning spaghetti sauce, you can pop tomatoes that are very ripe or damaged into the freezer, until you have enough for the recipe. I usually core the tomatoes and half or quarter them (depending on the size) before freezing. Then, when I am planning on canning spaghetti sauce the next day, I place them in the sink overnight to thaw. In the morning, you can pour off some of the clear juice if you like so that the cook down quicker. Weigh them out, dump them into your stockpot, and start cooking. I have found that ripe, undamaged tomatoes will easily keep for a week or more at room temperature. Cracked or otherwise damaged tomatoes will only last a day or two before spoiling and/or attracting fruit flies, so they should be processed in some manner within 24 hours, if possible. If you have fruit that's refusing to ripen, check out “4 Reasons your Tomatoes Aren’t Ripening – And What You can Do About it“. If you have tomato blossoms, but no fruit, we have help for that, too. 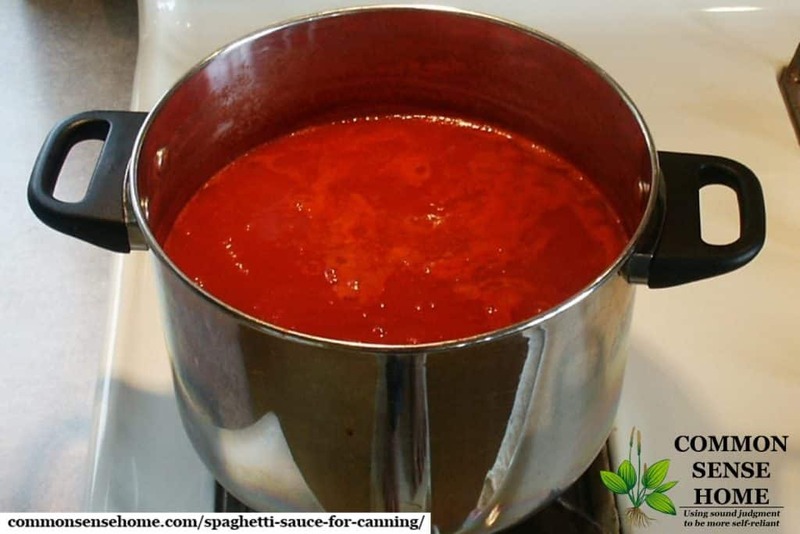 Never buy spaghetti sauce from the store again.This homemade canning spaghetti sauce recipe is slow cooked and loaded with flavor. May also be used fresh or frozen if you don't have a pressure canner. Wash 30 pounds of tomatoes. Remove cores and quarter tomatoes. Boil 20 minutes, uncovered, in large pan (or pans). Put through food strainer or food mill. Cook down tomatoes to reduce volume and make a thicker sauce. Reduce volume by 1/2 to 2/3rds. While the sauce is cooking, you can do the rest of the prep work, like chopping the rest of your veggies and getting the lids and jars ready. Prepare pressure canner according to manufacturer's instructions. Saute in 1/4 cup butter or olive oil until tender: onions, garlic, celery or green pepper, and mushrooms. Combine sauteed vegetables and tomatoes. Add salt, black pepper, oregano, parsley and sugar. Fill jars, leaving 1 inch headspace. Adjust lids. Process in a pressure canner 20 minutes for pints, 25 minutes for quarts. If using a weighted-gauge canner, set at 10 pounds pressure at 0-1,000 feet above sea level; set at 15 pounds pressure at higher altitudes. If using a dial-gauge canner; set at 11 pounds pressure at 0-2000 feet above sea level; 12 pounds at 2,001-4,000 feet; 13 pounds at 4,001-6,000 feet; 14 pounds at 6.001-8,000 feet; or 15 pounds above 8,000 feet. Originally published in 2009, updated 2016, 2018. Good tutorials on both the spaget sauce and salsa! I've been making and freezing "raw" tomatoe soup and sauce – sure glad those 'maters made it before the frost nailed the garden! My question is if I could core the tomatoes and get the seeds out that way and than puree them in a food processor? It’s a lot easier to cook them up and then run them through a food strainer, food mill or chinois than to hand remove the seeds, but if you really wanted to, you could blanch the tomatoes to remove the skins, core them and seed them and then cook them down and run them through a food processor. Alternatively, you could core them, seed them and skip blanching, and just grind up the peels, too. Some people even skip removing the seeds – but I find them quite bitter and unpleasant when pureed. I bet your house smells heavenly! You really are my idol in all the canning goodness! Michelle, some of my favorite paste varieties are Amish Paste, Opalka and Purple Russian. For me, one or more of these three will produce large, meaty fruit and lots of them no matter what the weather conditions. My favorite seed sources are on the sidebar. It takes time to do this, but the technique is easy and the flavor is outstanding. I really don’t know. I always measure by starting tomato weight. Before I cook them down, there are around 21 quarts of quartered tomatoes, but I’ve never attempted to use a food processor, or measure them mid-processing. I'm down to my last can. It's time while there are still some tomatoes left. I keep looking back at this recipe, and after making a couple of batches of tomato sauce (not this recipe unfortunately as we just don't have that many tomatoes in our little garden) I wonder about the food ratios; you mention that "It is not safe to increase the proportion of onions, peppers, celery or mushrooms in this recipe if you are planning to can the sauce …" but you reduce the amount of tomatoes considerably during the entire process. Is this what you expect of the volume of tomatoes to vegetables? Glenn, believe it or not, I'm not a huge fan of basil. I use it pretty sparingly in the kitchen. You could probably sub it in for the mushrooms or any of the other non-acidic ingredients. As for the tomato ratio and safety issues, the quote was from the original recipe. What I believe she wanted to avoid was people overloading the sauce with other ingredients and losing the acidity of the tomatoes. You're only driving off excess water, not really changing the proportions, when you cook the tomatoes down, with or without the other veggies. Either should increase the acidity of the end product. If one was to add an extremely high proportion of non-acidic ingredients, you could potentially create a low-acid environment that would be much more prone to spoilage. I don't think tweaking a bit this way or that would be a problem, but some people go overboard. If it's really a concern one could use a pH test on the final product before canning and add some lemon juice or vinegar to lower the acidity if needed. While basing processing times on the lowest acid ingredient may by effective, other factors may be at work, like thickness of product. Given the wide range of skill levels of people using recipes on the site, I try to keep things as simple as possible. Personally, I most assuredly do taste it, and think it tastes terrible, which is why I’ve switched to non-GMO citric acid for plain tomato sauce. If you or anyone else decides to add lemon juice to this recipe, please do a pH test before attempting water bath canning. You can taste the lemon. I did diced tomatoes a few years ago this way. It was gross. Looks good. Just got done canning 15 pints spaghetti sauce today. 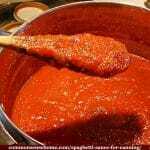 Can the tomato sauce be processed in a hor water bath canner? Water bath canning is not recommended for this sauce because the additional ingredients (other than tomatoes) raise the pH of the final product to a level where water bath canning is considered unsafe. Can you leave out the sugar? I never put sugar in my spaghetti sauce. I usually avoid adjusting canning recipes, but since this is pressure canned for a long period of time, I think it should be okay. So glad I found this recipe! I plan to make some spaghetti sauce tomorrow (already have a “killer” recipe for salsa 🙂 Thank you! You’re welcome. Still waiting patiently for my tomatoes to ripen this season. The cool summer has everything behind. I made the spaghetti sauce today and it is delicious!!!!! Yay! I’m still waiting for my tomatoes to ripen this year. It’s been such a cool spring and summer. For the stewed tomatoes, I followed the Blue Book directions. Peel the tomatoes and put them in a large pot. Heat to quite warm ( no need to boil, you just don’t want to put cold food in hot jars). Add 1 tablespoon lemon juice to each pine, 2 tablespoons to each quart jar. This makes sure that the tomatoes are acidic enough to safely can, as many modern varieties are less acidic. Pack tomatoes into hot jars. Poke are press down with a wooden spoon or chopstick to make sure the air is out. Leave 1/2 inch headspace. Add 1/2 teaspoon salt per pint, 1 teaspoon salt per quart. (Optional). Put on lids and process pints and quarts 1 hour and 25 minutes in a boiling water bath or 25 minutes at 10 pounds pressure in a pressure canner. back in the day canning tomatoes was just tomatoes,.salt, sugar and we used basil. all fresh and in water bath. no vinegar, lemon juice or citric acid. a recent glance at ball book spaghetti sauce recipe online and a number of other on line recipes say to use either one of those w the recipe it gives. more research and we read todays genetically modified tomatoes need citric acid, vinegar or lemon juice for canning. whats ur experience on this? As far as I know, there are not currently any genetically modified tomatoes on the market – however – most modern hybrids are lower in acidity than traditional heirloom varieties. With the addition of herbs and/or other vegetables, this could place your tomato based sauce into the low acid range, making it a candidate for botulism or other food borne illness. Thus, the addition of lemon or vinegar to most current tomato sauce recipes. I think this sorta explains what I was asking. todays tomatoes are different than yester-years. Yes, that agrees with my understanding. Better safe than sorry, as we deal with nastier bugs than they did in the past. Thank you for your words of encouragement. Some days it’s tough to find the energy to tackle it all. The kind words help keep me motivated. Will a food strainer thing for the kitchen aid work as well? Anything that will get the seeds out should do the trick. Do you think you could use canned tomatoes if you don’t have enough from the garden? If so how much? I measure all the tomatoes by weight, so I’d do the same with canned tomatoes. Hi, sounds wonderful! I can my tomatoes only. Any way you can break your reciepe down for a pint of tomatoes? It’d be an awful lot of work to fire up the canner for a pint of anything, but you could divide all the measurements roughly be 12 if you just wanted to make it to eat right away. I admit I did not read all the previous comments – just a quick scan. I was just wondering if it would be safe to remove the sugar from the recipe? Sugar ties up free water, which inhibits microbe growth. Given that the sauce is pressure canned, it should be okay, but I always hesitate to significantly modify an approved recipe. Finally found THE recipe! It was well worth the time involved. I got 9 pints. I wish it wasn’t so late in the season so there would be enough tomatoes to make another batch!!!!! Planning for next year…. I’m just wondering why you use so many pots and don’t try using an electric roaster? It sure cuts down on the extra work. I didn’t have a roaster. Since this is pressure canned, the ratio of veggies will not affect safe acidity levels; that is only an issue with water bath canning. I am hoping to have a good crop of tomatoes this year and will try this recipe. I’m still on the look out for a great tasting speghetti sauce recipe. thanks. Changing the amount of vegetables with pressure canning can still be an issue, because it can change processing time. We add a lot more onions and and garlic to our 30 lbs of tomatoes and more spices too. We do add a tablespoon of lemon juice to each quart jar and have never had a problem with spoilage. Hello thanks so much for the recipe. Planning on making this tonight but had a couple questions. I didn’t read anything about removing the skins. Should I leave them on? Also can I process themm in a magic bullet and just leave the seeds in my sauce? Thanks. The seeds are removed with the food strainer (“Put through large food mill or sieve.” ) – fourth photo on page. There are websites out there that will recommend pureeing seeds and skins in a high powered blender, but I’m not one of them. I tried it – once. The result was an incredibly bitter, basically inedible sauce. It was foul. Skins alone might not be quite as bad, but if you’re straining seeds you might as well strain skins, too. Hey Laurie, I love the recipe, but have a question: Is there a reason that you cook the tomatoes down for the 20 mins before straining out the skins and seeds? Why not just chop them and put them through the strainer before beginning the cooking process? Just wondering if there was a specific reason? I cook them before straining to soften the flesh of the tomato so that you get maximum juice/pulp extraction. Thanks for your quick response. It’s a wonderful recipe that we will enjoy all year! You’re welcome. I tried out a new tomato soup recipe last week that I’ll have live on the site this week. Can you can sauce that has Parmesan cheese (grated Kraft in a shaker canister) in it? Canning cheese products is not recommended. I did the same thing. I used the traditional canning recipe and added Parmesean (because I normally add Parmesean, I did it without even checking the recipe). Now, I’m wondering what to do with all of this sauce. I had already canned 6 quarts before it occurred to me. Can I freeze the sauce with Parmesean? Yes, freezing should work just fine. If I added 2 T. bottled lemon juice to each jar could I process them in a water bath? I wouldn’t recommend it, but if you did it and tested the pH and it was below 4.6, it should be safe. That much lemon would really make the taste less pleasant. The sauce can also be frozen if you don’t have a pressure canner. My family brings the processed tomatoes to a boil and then places them in sterilized jars. The lids are simultaneously boiling in water and are pulled out one by one and placed on the jars, topped off with a ring. The heated lids form the seal then with the heat from the tomatoes. We only put the jars in water if the tomatoes were not very hot. Lots of families process tomatoes the same way. My mom did that years ago. Unfortunately, with the more deadly microbes we have now, a better understanding of food science, and the higher pH of many modern tomato varieties, it is no longer recommended for safety reasons. I’m not sure if I’ve shared this with you before but I apologize if I have. So, one year I had a HUGE crop of ‘maters and no time to prep and can them. So I rinsed them, and froze them whole. Then that winter I had to figure out what I was going to do with all these frozen tomatoes. I had wanted fire roasted tomatoes like the ones from Muir Glen. But grilling tomatoes is a thankless and wasteful job. Luckily, I discovered that if you take the frozen whole tomatoes out of the freezer and set them on the counter for 45 minutes, they are then barely soft enough to cut in half. Take the frozen halves and lay them face up on a cooling rack set over a sheet pan and put in a 350 degree oven for one hour. The only caution I would share is all the water will be in the sheet pan so use extreme caution pulling them out of the oven. (I cool the water and give to my plants or pour over my dogs food) So now I have roasted halves of tomatoes. I let them cool a bit and then gingerly pick them up by the underside and using clean hands of course, squeeze the meat out into a dish and what’s left is either the skin (on the bottom half of the tomato) or the skin and stem (on the top half). I then give the skins and stems to my chickens who are VERY happy to get this bounty. What I have is a lovely roasted tomato puree that needs only a bit of salt and herbs to make marinara sauce. No need for paste or hours of cooking. You should try it sometime. It really is a great way to make marinara sauce. And I just water bath canned them. I would love to hear what you think about this method as I literally stumbled upon it trying to figure out how to deal with bags of frozen whole tomatoes one year. I have never seen anyone else do this so…. I don’t think you shared this before, or if you did, I can’t recall. I’d probably freeze, dry or freeze dry the resulting sauce, because tomatoes can be right on the edge of the current guidelines for safe water bath canning in terms of pH. The current recommendations called for added lemon or citric acid to canned tomato juice, tomatoes and sauces, which affects the flavor quite a bit (to me). if you did some pH testing and made sure it was below 4.6, then you’d know for sure you were out of botulism land. Do you have a brand or type of pressure canner you recommend? We did hot water bath canning last year but have 16 tomato plants and want to try doing sauce this year. I have two Presto units, a Presto 01781 23-Quart Pressure Canner and Cooker that I use for larger jobs. I take the rack from my other unit, and can use it between pint jars to stack two layers high. I also picked up a Presto 01745 16-Quart pressure Canner and Cooker a few years ago, because the smaller vessel cycles a little faster with small batches. Both work well and get the job done. My dream canner would be the All American 921 21-1/2-Quart Pressure Cooker/Canner, which has a metal on metal seal (no rubber gasket), and is made to last a lifetime – possibly several lifetimes. I have already finished my canning this year, but for future canning… if you leave out the mushrooms, is it safe to increase the other non-acidic ingredients (onion, celery, bell pepper)? It seems logical to me, but haven’t found any guidelines to confirm. And if so, would the safe amount of increase (onions, celery, bell peppers) be 1 lb. total? I don’t see any good reason to add the mushrooms to the sauce before canning, since the finished product will be used in a variety of ways, and I can always add mushrooms before serving, if desired. Yes, as long as you stay within approximately the same volume/weight, the pressure canning process should allow some wiggle room. I’ve never measured exactly, but I typically end up with 8-10 pints of finished sauce. With water bath canning, it’s not safe to substitute fresh herbs for dry, but since this is pressure canned it should be okay. I’d use double the amount of fresh oregano. I stumbled across your tomato sauce recipe and am making a batch now. I had a bushel of Roma tomato’s and the end weight is around 38 lbs. I eliminated the mushrooms and had several tablespoons over the 1 cup of both green peppers and onions not much though. I am wondering if you have heard of or have tried using canned tomato paste to thicken your sauce. Also I would like to add dried basil would that alter the recipe? Dried basil should be fine, as should a small amount of tomato paste or powder. Just don’t get the consistency too thick, or that will impair heat transfer and could lead to unsafe canning conditions. How long does the spaghetti sauce stay good for? At least 2-3 years. I’d try to use it up before then. HI, New at canning and diabetic, eat Low Carb HIgh Fat. Can I leave out the sugar or sub a natural sweetner like stevia? As long as you pressure can the finished sauce, it should be okay to omit the sugar. Would love to try this recipe but wonder if you have any that I can use Water bath canned? I don’t have one on the site. To safely water bath can tomatoes, you need to add lemon juice, which changes the flavor, or citric acid, which has less impact on flavor. You can safely water bath can plain tomato sauce by adding 1 tablespoon lemon juice per pint (2 tablespoons per quart). Process pints 35 minutes and quarts 40 minutes in a water bath canner. I have only canned using a water bath. Do I understand correctly that I can use your recipe just add 1 Tbsp lemon juice to pint prior to filling and processing? Any idea if canning jars can be used in Instant Pot? I understand that to be a pressure cooker. Thanks, Rose. An Instant Pot is a pressure cooker, not a pressure canner, and is not safe to use for canning. I do not recommend water bath canning this sauce, even with added lemon juice. The print page should open in a new tab when you hit the print button. Otherwise you can always copy and paste the recipe into a word processing program. There’s only 2 tablespoons of salt for 30 pounds of tomatoes, so the concentration of salt is pretty low. It can be left out if you prefer, but you should know that salt is not the demon that it’s been made out to be in recent years. See “12 Reasons Why Salt is GOOD for you!” for more information. My sauce is extremely runny despite cooking it down forever. Is it safe to add cornstarch to thicken prior to canning? I might add that some of my tomatoes were previously frozen and some were fresh. It measured about 30+ pounds. And if I omit the mushrooms do I have to add another cup of peppers, celery, or onions? You don’t need to add addition peppers, celery or onions. If all you have available for thickening is corn starch, it’s better to wait to thicken until after canning. Corn starch may clump during canning. A better alternative is UltraGel or ClearGel, which is specifically made not to clump during canning. You’re welcome. We need to tackle garden chores and cleaning this afternoon (our open house is coming up soon), but I know others are working on weekend projects, too. If I use all paste tomatoes, the sauce turns out thicker. With a mix of tomato types, or if the weather has been rainy, it’s tough to get it as thick as we prefer with just cooking it down. So I’m interested in trying your recipe but I would love to add olives without decreasing the other vegetables. I understand that this would offset the approved acidic level that you have. What would I need to do to bring it back into balance? More tomatoes? Longer processing time? And thoughts or suggestions? Add them when you heat the sauce for serving? That would be the simplest. With pressure canning, there is some wiggle room in the pH (because it’s used with low acid foods), but I’m hesitant to make specific recommendations because your sauce might be thicker or thinner, or… You can probably add a cup or so, but I sure as heck don’t want to be responsible for someone mixing up something that get’s them sick. Hi could I cut everything in half to make a smaller batch? Thank you can’t wait to try! Does the size of the chopped mushrooms or celery or onion make a difference? Could they be pulverized with an immersion blender to “hide” them from my kids but still have the taste? It’s no problem at all for the veggies to be well blended. If anything, it’ll improve heat transfer within the jars. How long do you cook the tomato sauce down for? As long as it takes to get the sauce to your desired thickness. This will vary depending on the moisture content of your tomatoes, your stove, your cooking pots and how frequently you stir. As I mentioned in the post, I start out cooking multiple pots, but when the spaghetti sauce is ready to process, it all fits in an eight quart stock pot. My tomato sauces are alw as ys so watery or thin. Is there anything I can do? What could I be doing wrong? How long do you cook your tomatoes? For a thicker sauce, it really helps to start with very meaty paste tomatoes. Without paste tomatoes, I end up cooking it down for most of the day. I like Frontier organic tomato powder, but there are other options available. Sometimes I make tomato puree and dehydrate it, and then add chunks of the dehydrated puree to thicken my sauce when getting ready to serve it. Oh – dried, very finely shredded zucchini can also be used to thicken the sauce and sneak in more veggies (when you’re getting ready to serve, not before canning), but of course it doesn’t add more tomato flavor.